What is the Dexalytics Score and how can I use it? Data without context are just numbers…and in sport today there can be a surplus of numbers and a shortage of data. With anything, you have to understand the context under which the data were collected. We developed the Dexalytics Score to add context to body composition numbers to make it actionable data. It is a composite score that is made up of layers of information that provides a more in-depth interpretation. 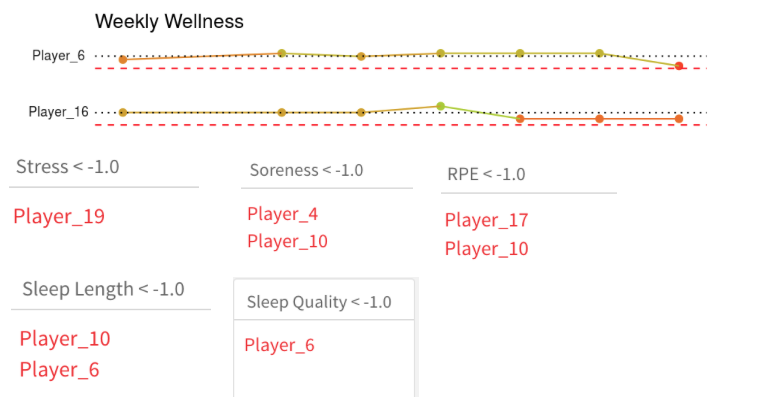 For example, the plot below is from a player wellness survey for a team. The data uses a z-score of each player’s data for easier player comparison. The Wellness Score is a composite score of five values from the wellness survey. From just this image, we see 4 players are below their average and player 6 is the lowest for the day. However, this alone is not enough information; we need more context to see the bigger picture. So let’s take a look at this individual’s last seven days. We see player 6 seems to have had one bad day in an otherwise good week (black line is their average), whereas player 16 has been down for three straight days. Bad days happen to everyone, but three days below average may be more concerning than one bad day. But let’s remember this is a composite score, so the next layer we need to think about is the different parts that make up that composite. By looking at those we can dive deeper into the issue. What we learn by looking at the components of the score is how each athlete got to their total. Player 6 clearly had a poor night’s sleep. 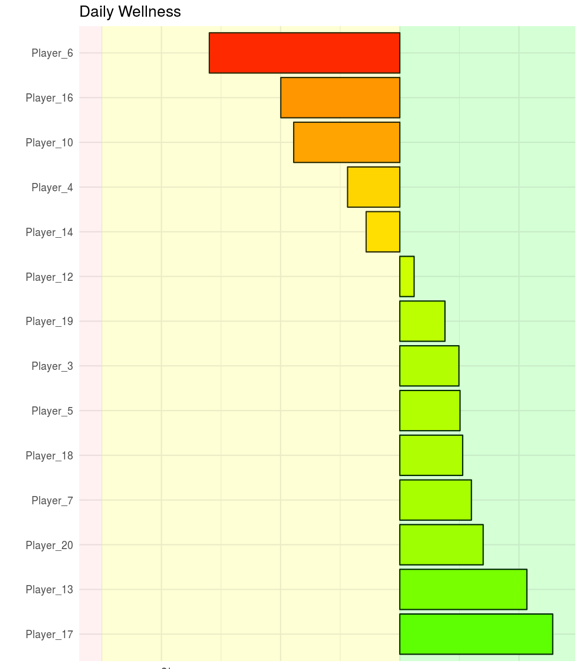 Where player 16 must be low across all components but not severe enough to be an alert. All three layers allow more information to be brought into the interpretation. This is how we think about body composition and one of the drivers for developing the Dexalytics Score. Calories are the sum total amount of energy provided by a serving of this food. However, the components of where that energy comes from is more important than the calorie by itself. 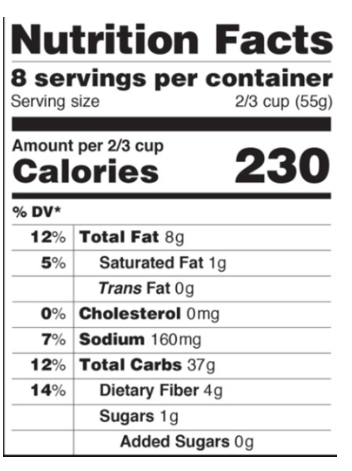 Would you think differently about this 230 calories if it was 25% carbohydrates and 10 grams of sugar? This is the same idea behind the Dexalytics score. We are creating a composite of the variables that are important to add more context around body type and body composition. The Dexalytics score allows us to identify, “if a change is needed”, the area(s) that can be addressed. I quoted that line for a purpose, changes to an athlete should be made when you feel it will create a significant improvement in on-field performance. Having an ideal body type and body composition does not guarantee that player will perform well in their sport. There are a multitude of other factors. The Dexalytics score provides insight and context into each athlete’s optimal body type (for their sport) and compares it to positional ideals. It also provides a step in the decision tree for what to do with an athlete. Let’s take a look at how we can use it. We are looking at the last 3 scans for this athlete. The first is a post-season scan, and the following two are off-season and then a preseason scan. Right away we see a drop from the first to the second scan, with an equal drop in the fat and lean mass indices. This tells us they have moved away from optimal for both themselves and their position. However, this alone is not enough, we need to ask the question, how are they performing on the field? In this case the answer was, “they are a little slower out of their cuts and don’t seem to have the same burst of acceleration”. Okay, so their performance has been affected and may be associated with a change in their body. So where did this change come from (i.e. what parts of the body changed). So let’s look at some of the components of the score. Leg muscle mass has been consistent, but over the last 3 scans there has been a lot more fluctuation. Specifically in the last three scans Dec-April-June. 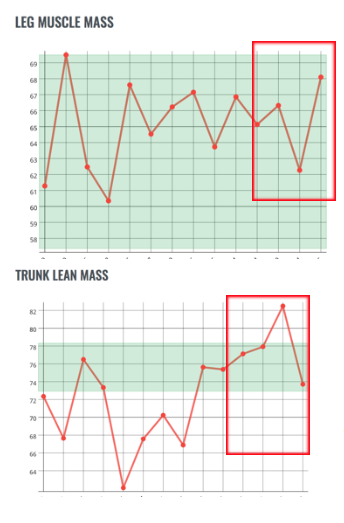 Now let’s look at Trunk Lean Mass over that period. There has been a lot more fluctuation and there was a big increase from December to April of this year. Combined with the leg data (decrease) we see this individual has become more top heavy from December to April. This shift is one we alert for in our software. We see a big increase (outside of the position ideal) from December to April. And additionally his Lean upper to lean Lower ratio is affected as well. Taking all of this information together, it makes sense that this shift may influence both his cutting and acceleration abilities. We will dive into ratios a little deeper in another blog, but essentially it is comparing a person’s distribution of mass between the upper and lower parts of the body. The big take home is that we have to understand what components of the total are changing to understand the influence of body composition on performance. How do we generate the score? At the start of this blog, we discussed the importance of context with data. And in sport, most often, we measure things to understand how they will affect the performance in an athlete’s sport. This is no different with body composition. We wanted to provide context to how body types and body composition affect on-field performance. We do this by allowing our users to identify the context in which the data is scored. They know much more about their players, their tactics and their positioning than we ever will. Thus they are the best individuals to identify the performance context on which to score their athletes. They identify the top performers for each position/event for their particular sport and Dexalytics analyzes and compares the entire team against those individuals. In doing so we begin to identify if body type/composition is the limiting factor for on-field performance. In some cases the answer may be yes, but in others, the answer is no, and more time should be used to focus on other physical attributes and their tactical/technical skills.